Over 80 lawyers in the U.S. have notified us that they were contacted by the purported Hanako Simmons with regards to a to a collaborative family law agreement dispute. This is a fraud we have seen before under several other names and similar scenarios. For examples of other names attached to this kind of fraud see our Confirmed Fraud Page. For an explanation of how this fraud works see our Fraud Fact Sheet. Thank you for your prompt response. Sorry for the delay. Am in Japan for an assignment and Konami Simmons (ex spouse) lives in Durham, North Carolina. Due to the time difference (+13hrs EST) it is a little bit difficult to determine the best time to call you. Following our divorce, we agreed under a negotiated settlement agreement which is incorporated, merged into and made part of the court decree for a onetime cash settlement of $557,000.00USD for Family support (this includes child support, alimony and medical support). To his credit, he has paid me $208,000.00USD from a total of $557,000.00 but still owing $349.000.00USD and the due time for completion of payment is over. Thus, I request your legal counsel and representation to enforce the final judgment thereby compelling him to remit the balance owed me. He is aware of my intention to seek legal actions. Attached is a copy of the separation agreement, and Final Judgment and I will be pleased to provide further information on this case on request. I desire to retain your law firm, please forward your firm’s retainer fee agreement so that we can proceed. Thank you and have a pleasant day. Make that 41 attorneys contacted by this scam artist. I am a paralegal and I have dealt with a few others in the past. 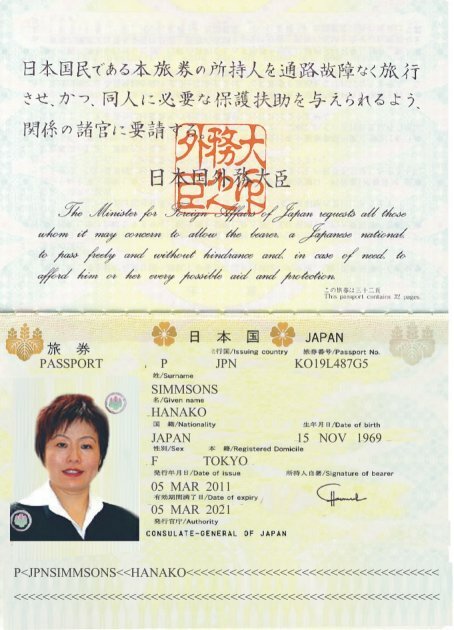 Did anyone notice that throughout her documents her surname is SIMMONS however, on her fake passport her surname is SIMMSONS. That was my first clue. I found it interesting that our proposed client felt the need to copy her passport and sent it along. Why? Then I was alerted when the purported judgment was written entirely in English from a court system in Japan, yeah right! I received this email too! I sent “her” an engagement letter and sure enough a few days later I received a UPS envelope with a PNC Bank check for 289K and a “memo” from her husband. Thinking it was too good to be true, (why wouldn’t the husband just send the check directly to her and avoid paying legal fees?) I made a simple Google search and found this page! I contacted the bank, as this con artist emailed me wire instructions, and let them know the whole story. Now this person is attempting to call my office (look out for numbers 225-5555 no area code shows up, and 819-700-1868) and emailing me about her poor daughter who is going into surgery and the doctor needs the money right away! Its a male female team as the secretary here is now starting to get calls from a Dr. Simmons, the best part is that these people don’t even have Japanese accents! This is purported to be a Japanese agreement. The only foreign language on the decree and the agreement is Korean and not Japanese. Add me to the list! I just got the “check” sent overnight w/ instructins to deposit in my trust account. I have been suspicious since firts being contacted, but with the arrival o the check I thought this might be legit. Out of curiousiy I googled Simmons and found this blog. Well, it was nice to think I made some $$$!!! Oh well……..
Just keep your eyes open – the scammers usually leave little clues…..
[email protected] is probably another alias. I wish to file an enforcement petition/Judgment enforcement against my ex-spouse for breaching the court’s decree with regards to payment of Child Support, Spousal Support and Medical Support. Kindly reply me via [email protected]) if your firm handles such case. I’m a law student in NC and I was targeted by this scam as well. I explained to “Hanako” that I can’t represent anyone since I’m only a student. I was about to pass the email along to my supervising attorney at the firm I intern for, but thankfully found this before we contacted her or I embarrassed myself. I’m not sure where these scammers got my email, but my mind immediately goes to one potential suspect: LawCrossing. I receive an avalanche of spam from them, even though I’ve never signed up for or paid for their service. I got it, too. Being highly suspicious of the whole thing, I emailed back and told the woman purportedly in Japan that we don’t accept engagements by email only, that we would have to talk. Surprise! I found a voicemail today, left mere hours after I sent the ‘we need to talk’ email, supposedly from this lady in Japan. While her accent sounds Asian, it does NOT sound Japanese (I have have some familiarity). Remarkable that they have the gumption to actually call, though, during business hours–she might have actually reached me if I hadn’t been in court. Make that another potential victim. The response letter I read at the beginning of this site was word-for-word the response I received. I am just curious here, has any attorney attepted to deposit the check and if so, what happened? There is usually no problem depositing the checks. The look convincing and can fool bank tellers. Eventually however, the bank will discover it is counterfeit. If the lawyer has already wired the money overseas, he’ll be left with a big hole in his trust account. There is usually no problem depositing the checks. They look convincing and can fool bank tellers. Eventually however, the bank will discover it is counterfeit. If the lawyer has already wired the money overseas, he’ll be left with a big hole in his trust account. > Spousal Support and Medical Support. > Please i need to know if you can help me. Same here. Emailed me a couple of months ago, went away, and I have rceived two more in the last several days–same exact email, different name at the bottom.